Anderson Cooper, anchor of CNN’s Anderson Cooper 360°, will be the Keynote for Elliott Masie’s Learning 2016, for 2,000 corporate leaders of employee training. Anderson Cooper, anchor of CNN’s Anderson Cooper 360°, will be the Featured Keynoter at Elliott Masie’s Learning 2016 Conference, to be held in Orlando, Florida from Oct 23rd to 26th. 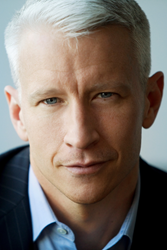 Anderson Cooper will be interviewed by Host Elliott Masie during an interactive in-depth conversation on “A 360-Degree Look at World Events”. Learning 2016 participants will include thousands of corporate leaders of employee training and development from major organizations around the world. Other keynoters for Learning 2016 include Astronaut Scott Kelly, Actor George Takei, Filmmaker Tiffany Shlain, and Human Resource and Training Leaders. “We are honored to have Anderson Cooper at Learning 2016. In these turbulent times, with news impacting our world continuously, it will be a treat to interview Anderson Cooper about ever changing events, the current political campaigns and his interactions with leaders on these key issues,” said Elliott Masie, Host and Curator of Learning 2016. Anderson Cooper is the anchor of CNN’s Anderson Cooper 360°, a nightly newscast that goes beyond the headlines – keeping politicians and policy makers honest with in-depth reporting and investigations. Since the start of his career in 1992, Cooper has covered nearly all major news events around the world, often reporting from the scene. Most recently, he has extensively covered the conflicts in Syria, Iraq and Egypt, the riots in Baltimore, MD and Ferguson, MO, Pope Francis’s U.S. visit and the terror attack at Charlie Hebdo in Paris. Cooper has also played a pivotal role in CNN’s political and election coverage. He has anchored from conventions and moderated several presidential debates and town halls. In addition to his shows on CNN Cooper is also a regular correspondent for CBS’s 60 Minutes. "The Rainbow Comes and Goes: A Mother and Son Talk about Life, Love, and Loss," a collection of correspondence between Anderson and his mother, Gloria Vanderbilt, was published April 2016. "Dispatches from the Edge," Cooper’s memoirs about covering wars and disasters, topped the New York Times' bestseller list and other bestseller charts. Learning 2016 takes place October 23-26 in Orlando, FL. It is produced by The Learning CONSORTIUM, a collaborative of 200 global corporations, focused on improving workplace learning and training. Hosted and curated by Elliott Masie, Learning 2016 brings together several thousand learning professionals as they focus on the changing nature of workplace education and development. Details on Learning 2016 can be found at http://www.learning2016.com.